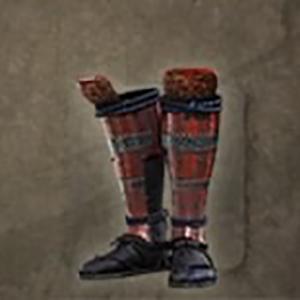 Last Great General's Armour: Suneate is a Foot Guards in Nioh. "Greaves made of multiple long, thin metal plates that are lightweight and sturdy enough to handle fiercest of battles. They are coated in crimson lacquer to match the rest of the set. Part of a traditional armour set known as Tosei-gusoku in Japanese, this armour was said to have belonged to Sanada Yukimura, who was awarded the title of Last Great General of the Warring States after dying a courageous and glorious death at the end of a valiant defensive campaign during the summer Siege of Osaka. Yukimura, covered in wounds from head to toe, fought through waves of enemy soldiers before attacking Tokugawa Ieyasu, however his attempt ended in failure, and it is believed he succumbed to a shower of bullets. The armour set includes a tabard worn by Todogimi that features a design modelled after the Japanese milk vetch plant, which symbolized reprieve from suffering."